It was another great win for Valtteri Bottas, his second of the season after a rocketship start from pole position. The Finn was only a few milliseconds off jumping the start, he described it as the ‘start of my life’ and he needed it on a day when Vettel was on form. The German leaves Austria with a 20 point lead over Lewis Hamilton. Vettel was adamant that Bottas jumped the start and said that he found it distracting when judging his own start. “I don’t believe it”, he said when told that Bottas’ reaction time was in milliseconds. 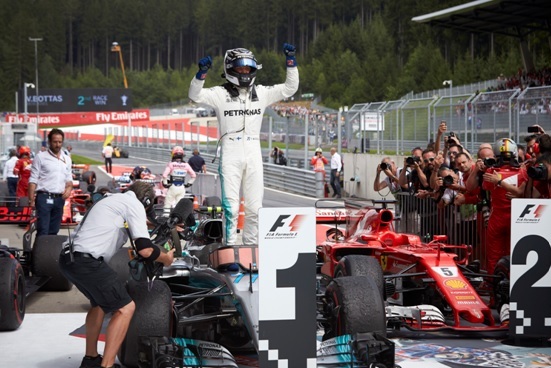 Bottas, however, is now a contender for the world championship, just 15 points adrift of his teammate Hamilton in the standings as we approach the half way stage. “I believe and the team believes” said Bottas of his chances of taking the title in his first season with Mercedes. It was the fourth time this season that Hamilton has finished a race but not made the podium. In comparison, Vettel has only had two finished where he didn’t stand on the podium. What was very encouraging about the result in Austria was how close the top four cars were at the finish. Vettel was only 0.6secs behind Bottas while Ricciardo was only five seconds back in the Red Bull. With all the upgrades coming on the cars, it is impressive how close Mercedes and Ferrari remain. While Red Bull appears to be closing up too, which is encouraging for the second half of the season. Ferrari has an engine upgrade for the next race in Silverstone, a track that should really suit their car. 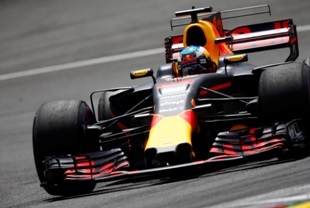 Daniel Ricciardo’s fifth consecutive podium was built on his actions at either end of the Grand Prix. He made a decisive pass on Kimi Raikkonen at the start of the race and then had to defend from Hamilton in the final lap. Red Bull looked as though they were going to be around 7/10ths of a second a lap slower than the front-runners, but in the end it was closer. Mercedes again seemed to struggle with the softest of the Pirelli tyre compounds. However Ricciardo’s teammate Max Verstappen had another retirement, his third in a row and the fifth of the season. 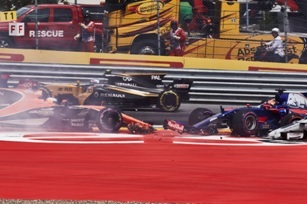 This time he was the victim of a lunge by Toro Rosso driver Daniil Kvyat on Fernando Alonso, which smashed the Spaniard into the Dutchman and led to the retirement of both. Kvyat is likely to be in serious trouble with the Red Bull management for that, rather like the Sochi 2016 episode, where he was demoted from Red Bull for causing a collision at the start, which led to Max Verstappen taking his seat for the next race in Spain. The battle in midfield was pretty exciting, thanks to the chaos at the start with Kvyat triggering the accident with Verstappen and Alonso. This opened up the midfield as they drive around it and allowed the Williams pair to leap up from 17th and 18th on the grid up to 10th and 11th. Grosjean also made it up to the top four briefly, while the Force India pair were again assured in steering through the trouble. Williams had split the strategies, possibly thinking that rain had been forecast and that this gave them the best way to hedge their bets. Stroll was on the supersofts, Massa the softs. Massa did very well on these tyres to Lap 48. This set him up for a final 23 lap blast on ultrasoft where he would attack Ocon, Perez and Grosjean. Who were all on older supersoft tyres. But disappointingly he did not have the pace on the new tyres to attack. It was a great day for Grosjean and Haas. One thinks of him as always complaining on the radio about the balance and the brakes and then he gets a result like this, his fifth points finish of the season. The Force India duo again bagged points in 7th and 8th , while Lance Stroll managed to score a point for the third race in a row.